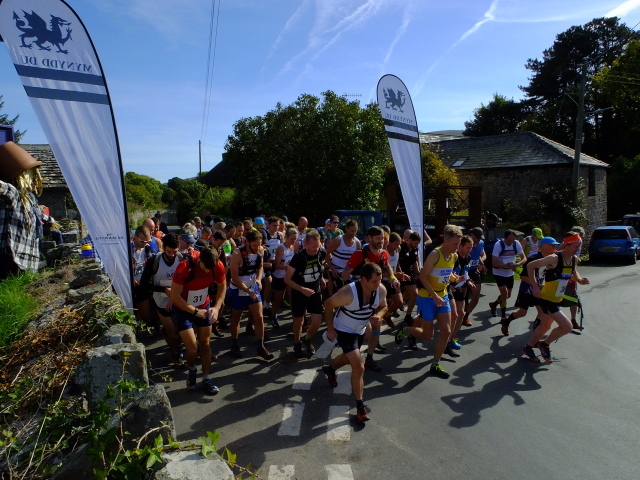 Conditions were perfect for runners this year in the Black Mountains Race. Tim Lenton from Axe Valley Runners was the male winner, and could surely improve his time of 2:46:20 in future, having taken a few sub-optimal lines. He was still a convincing winner over Ben Arkell of MDC in second, and 3rd place Southville’s Gareth Williams, who just prevailed in a final hill sprint with Dan Sandford over the last couple of hundred metres. GB international Lizzie Wraith won the women’s race in 3:17:13, but only just held off host club Mynydd Du’s Rhian Probert, 94 secs behind. Vicky Shaw from Stubbington Green Runners in Hampshire was third. The female veterans' prizes were a clean sweep for Mynydd Du, courtesy of Sasha Habgood (v40) and Rona Davies (v50), who, with Rhian Probert, also took the team prize. It was a good day for male veterans too, as the MV60 winner, Bryan Stadden (also Mynydd Du) beat all the MV50s! The overall winner was MV40 so the prize deferred to Dan Sandford. Ian Andrews, unattached, was first MV50. Gareth Jones (MDC) won the MV70 category, despite his senior moment on Bal Mawr resulting in him being the last runner to finish.